As the world becomes a smaller place, global travel has become the norm for many companies. With this comes the risk of complacency in preparation, compliance and adherance to company policies and procedures. In many instances, this complacency also extends the to the company and its management processes. Our face-to-face travel safety course has been running since 2002 and is designed for any international business traveller. This course is designed around higher risk destinations or for those with less experience on long haul travel. Anyone who travels internationally for business purposes to, from or within destinations not classified as Hostile Environments can benefit from this course. This full day course is split between two 3-4 hour sessions carried out in the morning and afternoon of your chosen day. This course is the standard full-day Planet Wise International Travel Safety programme which has been adopted and implemented by a wide range of multinational organisations. This course provides valuable pragmatic lessons for any international business traveller travelling on company business. As with all issues relating to safety the key issue is attitude. Travellers sometimes think they know everything or simply believe nothing serious will happen to them. To overcome this understandable engrained complacency the day includes interactive and stimulating travel-related scenarios that challenge preconceptions and build a keen awareness of current and emerging risks. And it’s all delivered with good humour in a non-patronising manner and a non-threatening environment to ensure attendees get the best from the programme. Why Attend a Travel Safety Course? According to research carried out by the University of Luneburg in 2007 most business travellers significantly miscalculate the risks associated with travelling internationally. As the graph below illustrates, many of these individuals are unaware that they are at significant risk from some very common hazards and significantly overestimate the level of risk associated with some very rare hazards. For example less than 1% of travellers rated the risk of fraud as the most likely risk outcome or as the most severe potential outcome, however 19% of travellers that responded to the survey confirmed that an incident of fraud had actually occurred whilst travelling internationally for business purposes. More worrying still, around a third of travellers thought that some form of accident was the most likely outcome, but over half of travellers had actually experienced some form of accident whilst travelling internationally. Research suggests that 70% of large organisations and 25% of SMEs have a travel policy – but these are almost entirely about managing company spend – not protecting their most valuable assets – their people. 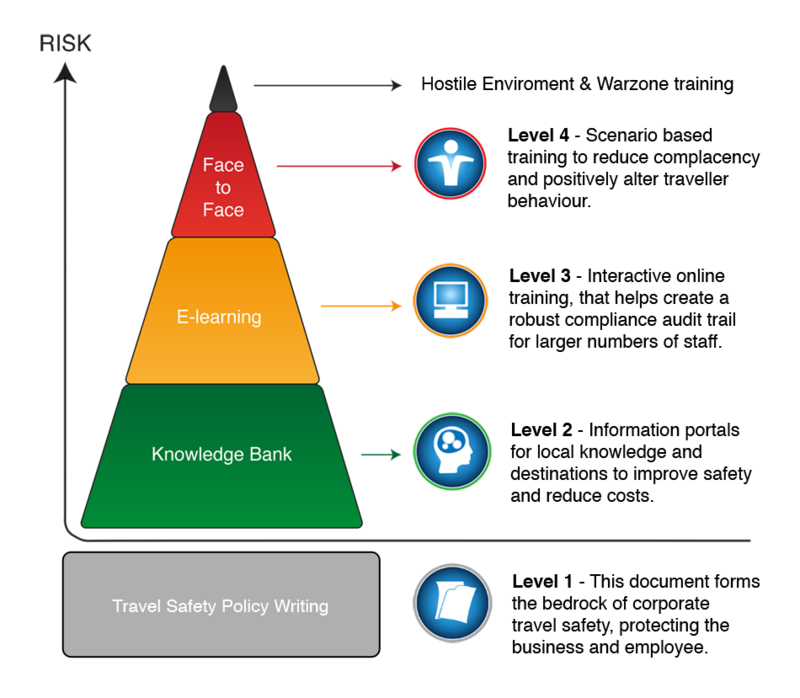 Today very few organisations provide staff with a suitable level of training in international travel safety, leaving many international travellers unknowingly exposed to a wide range of threats to their health, safety, security and wellbeing. The Planet Wise International Travel Safety course is designed to address this problem and to fulfil this requirement.